Lee Hildebrand was born in 1938 in Butternut, Wisconsin. He enlisted in the Aviation Cadet Program of the U.S. Air Force for Navigation Training on July 25, 1958, and was commissioned a 2d Lt and awarded his navigator wings at Harlingen AFB, Texas, on July 6, 1959. After completing B-66 Destroyer Combat Crew Training, Lt Hildebrand served as an RB-66 and WB-66 navigator with the 9th Tactical Reconnaissance Squadron at Shaw AFB, South Carolina, from April 1960 to August 1962, followed by service as a C-54 Skymaster and C-118 Liftmaster navigator with the 7167th and 1455th Air Transport Squadrons at Rhein Main AB, West Germany, from August 1962 to September 1965. His next assignment was as an RB-50 Superfortress, C-54, C-118, and RC-135 Stratolifter navigator with the 1371st Mapping & Charting Squadron (later redesignated the 1st Aerial Cartographic and Geodetic Squadron) at Turner AFB Georgia and Forbes AFB, Kansas, from September 1965 to April 1971. Maj Hildebrand then completed F-4 Phantom II Combat Crew Training before serving as an F-4 Weapon Systems Operator with the 13th Tactical Fighter Squdron at Udorn Royal Thai AFB, Thailand, from November 1971 until he was forced to eject over North Vietnam and was taken as a Prisoner of War on December 18, 1971. After spending 467 days in captivity, he was released during Operation Homecoming on March 28, 1973. He was briefly hospitalized to recover from his injuries at March AFB, California, and then received an Air Force Institute of Technology assignment to the University of Arizona from August 1973 to June 1975. Col Hildebrand served in the Directorate of Military Pay Operations with Headquarters Air Force Accounting and Finance Center in Denver, Colorado, from June 1975 to October 1977, followed by service as Deputy Director of the Directorate of Settlement and Adjudication with the Air Force Accounting and Finance Center from November 1977 to June 1980. 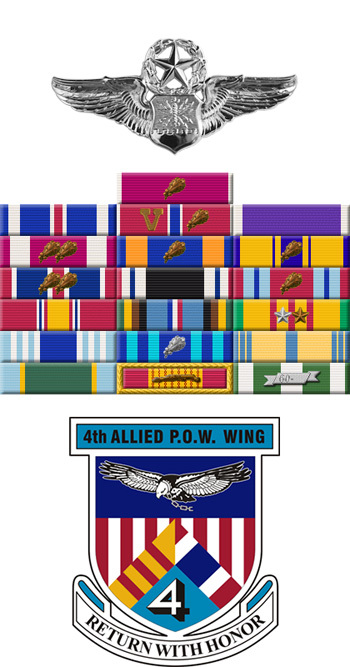 His next assignment was as Director, Cost and Management Analysis with the Deputy Chief of Staff, Comptroller, Headquarters U.S. Air Forces in Europe at Ramstein AB, West Germany, from June 1980 to June 1983. Col Hildebrand's final assignment was as Comptroller and Director of Logistics Management Systems with Ogden Air Logistics Center at Hill AFB, Utah, from July 1983 until his retirement from the Air Force on December 1, 1985. After retiring from the Air Force, Lee worked for Electronic Data Systems, retiring on January 31, 1996. Lee Hildebrand died on January 30, 2014, and was buried at Arlington National Cemetery. 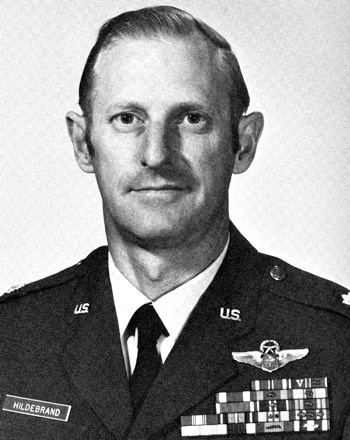 Major Leland L. Hildebrand distinguished himself by extraordinary achievement while participating in aerial flight as an F-4D Weapon Systems Operator at Udorn Royal Thai Air Force Base, Thailand, on 24 November 1971. On that date, Major Hildebrand led a flight of two F-4D tactical fighters against a bunker complex in Southeast Asia. Despite deteriorating weather and antiaircraft fire, Major Hildebrand aided his aircraft commander in delivering his ordnance with unerring accuracy which destroyed three large bunkers, damaged five others, and ignited a large fire which resulted in a large secondary explosion. The professional competence, aerial skill, and devotion to duty displayed by Major Hildebrand reflect great credit upon himself and the United States Air Force.